Happy Birthday and Blogiversary Kim! Kim over at Forever Daisies is celebrating her birthday and her blogiversary today. Swing by and wish her a Happy Birthday and Congratulations! And yes! I've seen polyvore before, but have never ventured in! Shall I?? Aw Happy B-Day Kim! And Barbara! How cute is this graphic? Love it. Liz: Thanks! I love it, it's my standard birthday graphic. 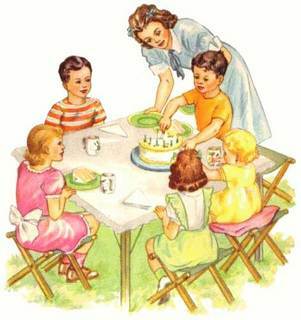 I keep looking for new vintage birthday images, but this is still my favorite. I LOVE the picture! Now to see her blog :)!